I had almost finished this book when I came to the realization that it was a novel. I knew that Chabon had visited his grandfather in the last weeks of his life. And as I read the book, the tale unfolded like a series of revelations about his grandfather and his family, with rich details that made me believe that at least some of this story must be true. 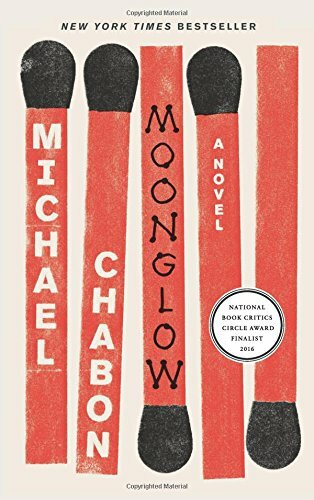 I’ve been a fan of Chabon ever since I devoured his book “Telegraph Avenue” a few years ago, and I looked forward to learning more about him and his life through this “memoir.” How did I not notice that the book is titled “Moonglow: A Novel?” It doesn’t really matter. I think I did actually learn a lot about him. The obvious love and admiration for his grandparents shone through. They were definitely “characters,” and I loved them for their passion and quirkiness from the very beginning. His grandfather’s life (as he relates it to Chabon) is fascinating and unpredictable. Bouncing from his time in Europe during WWII to life in mid-century America, this story helps illuminate the experiences of the Grand Generation. Although most people would agree that the story he tells is far from typical—he was actually involved in rocketry and the space program, while most people of his day just watched from afar. 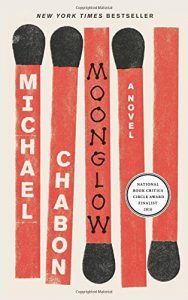 I credit Chabon with first-class beautiful writing, as well as telling a first-class compelling story. His reflections on himself as a young (ish) storyteller and his grandfather as an older storyteller are very revealing: “…it seemed to be in the nature of human beings to spend the first part of their lives mocking the clichés and conventions of their elders and the final part mocking the clichés and conventions of the young.” The publisher describes this book as, “A lie that tells the truth, a work of fictional nonfiction, an autobiography wrapped in a novel disguised as a memoir.” I encourage you to read it and see what you think.